When prospective college students arrive on the University of Northern Iowa’s web site, they can read all about Jen. Jen is a current student at UNI who shares some of the reasons she chose to attend the university. Jen shares her experiences as an UNI student. UNI.edu’s designers have put considerable time and effort into sharing the experiences of people associated with the university. The site has more than 40 detailed profiles of students, faculty, staff, and alumni. There’s a huge amount of information users can glean from these profiles. For example, I bet you didn’t know Entertainment Tonight’s co-host, Mark Steines, attended the University of Northern Iowa. Why did UNI’s site’s designers invest so much energy in these profiles? One reason is they know users need this type of content to make a decision about where to attend college. The designers’ research told them that, before choosing UNI, prospective students visited the web site with one main goal—to see what other students had experienced. The site’s designers do a great job offering users what they needed most: Inukshuk content. At User Interface Engineering, we use the term “inukshuk” to describe the type of content found in the UNI profiles. It’s the name of stone figures created by Inuit hunters as guide markers. The hunters arranged the piles of stones in the likeness of human beings, signifying to other hunters that someone already has passed through and experienced their same journey. An inukshuk provided reassurance and empathy to others and alleviated an Inuit’s fear that they were off the track. In our research, we’ve seen that, just like the Inuit hunters, users on the web want reassurance that others have shared their experiences. Many times, users are contemplating important decisions. To understand if they are making the right decision, they often want to go beyond facts. They want to know if it “feels” right. Inukshuk content, when done well, can give the user confidence in a way that factual content can’t. The Inukshuk content assures the users that other people have been there before, following the same path they are currently traveling. The users see that these other folks have made it through the decision process and can gain reassurance in their own decision. In this technical review on Amazon.com, the customer describes the features of their video camera. The technical review’s purpose is to give customers a venue to share the pros and cons of a product they’ve purchased. It’s a very fact-based discussion of the product. In this instance, the customer describes the features of the digital camera he purchased. This is typical of the technical reviews we see on Amazon, where the customers relay product facts. Aside from the technical reviews on Amazon, there are other customer reviews where the product’s features aren’t discussed at all. Instead, the writers focus on telling other readers about their particular experience with a product and how it worked (or didn’t work) for them. For example, a digital camera purchaser talks about how the camera enabled her to share pictures of her new baby and how it exceeded all of her expectations. We call this an Inukshuk review. Customers focus on their specific experiences with the product, with almost no technical information. Amazon’s inukshuk reviews focus on the user’s experience with a product. Inukshuk reviews provide users with important information they wouldn’t get from reading a technical description—the experiences of other users who faced similar decisions. We’ve seen that Inukshuk content is just as important to users as the technical reviews. Both technical and Inukshuk reviews are vital in helping users make purchase decisions. We see successful Inukshuk content on all types of web sites. 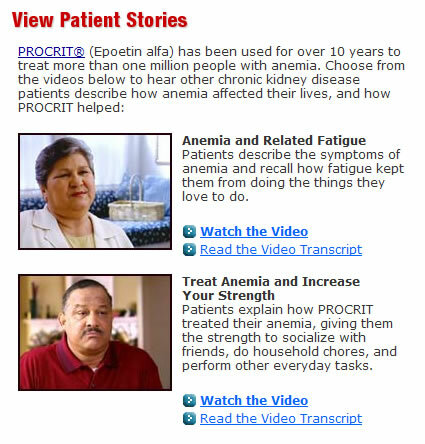 Procrit.com is a site designed to provide users with information about Procrit, a drug treatment for people suffering from anemia. When users arrive on the site, they have many questions about the drug treatment: What are the side effects for people who are using the drug? How happy have patients been with the regimen? How tired will I feel while taking Procrit?? To address these concerns, Procrit.com’s designers offer users videos with actual patients who’ve been treated with the drug. The purpose of these videos is to expose potential patients to others who have been in the same situation and reassure them that they will be okay. In our testing, users were much more confident about the drug after hearing these real-life stories. Fidelity.com’s design team used a similar tactic when trying to persuade job seekers that Fidelity is the right place to work. The site has an entire section devoted to current employee testimonials, offering users exactly the type of information they need at the time-reassurance that Fidelity is a great employer to consider. We’ve found that the most successful sites create Inukshuk content to help users feel confident in their important decisions. The content can take many different forms, including videos, testimonials, user diaries, reviews, ratings, and discussion boards. Regardless of the form, the key ingredient of Inukshuk content is that it lets your users know that they aren’t the first to deal with their specific types of issues. Others have traversed this way before. Published here on December 14, 2005. Christine Perfetti picked up on these approaches, refined them, and started using them in her daily work at leading companies like Acquia and Carbonite. Not only has she built successful design teams who’ve created business-changing products, but she’s transformed a design team from a siloed group into collaborative partners. 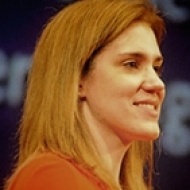 Her ability to bridge gaps and fuse product management with engineering will be evident in this talk. How Content Strategy Can Help by Margot Bloomstein Margot Bloomstein discusses the strategies content producers should take to optimize their writing.